The Nauvoo Legion was a state-authorized militia of the city of Nauvoo, Illinois, United States. With growing antagonism from surrounding settlements it came to have as its main function the defense of Nauvoo, and surrounding Latter Day Saint areas of settlement. The alleged Nauvoo Legion Flag. It is not known if it was used in Nauvoo, Illinois or in the later Nauvoo Legion Utah period. It may have also been used by the Mormon Battalion in the U.S. Army during the Mexican–American War (1846–1847). The Illinois state legislature granted Nauvoo a liberal city charter that gave the Nauvoo Legion extraordinary independence even though it was still a component of the Illinois State Militia and under the ultimate authority of the Governor of Illinois. Led by Joseph Smith, founder of the Latter Day Saint movement and a mayor of Nauvoo, the Legion quickly became a formidable concentration of military power. Previously, from May to June 1834 Joseph Smith led an expedition of Latter Day Saints, known as Zion's Camp from Kirtland, Ohio to Clay County, Missouri in an attempt to regain land from which the Saints had been expelled by non-Mormon settlers. He organized the first Mormon militia group known as the "Armies of Israel" to protect his people. In 1844, after a controversy stemming from the Nauvoo newspaper, who published articles critical of Smith and his church's policies. Joseph Smith was ordered to Carthage and was assassinated by a mob. Soon thereafter, the Nauvoo charter was revoked, and the Nauvoo Legion lost its official sanction as an arm of the Illinois militia. 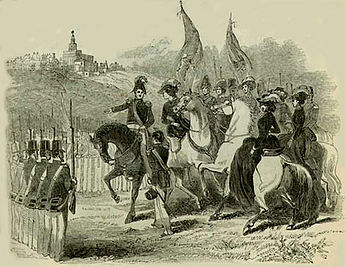 After the revocation of the Nauvoo Charter, the members of the Nauvoo Legion continued to operate under the command of Brigham Young, leader of the movement's largest faction, The Church of Jesus Christ of Latter-day Saints (LDS Church). Young led the Latter-day Saints to what later became the Territory of Utah. In Utah, the Deseret Militia and Utah Territorial Militia used the official name of the Nauvoo Legion. The Nauvoo Legion was permanently disbanded in 1887. In 1894, the former Utah Territorial Militia was reactivated and officially designated the Utah National Guard. In 1839, Joseph Smith relocated his followers from a hostile environment in Missouri to Commerce, Illinois, which he renamed Nauvoo. Voter-conscious Illinois Democrats and Whigs (including Abraham Lincoln) passed a bipartisan city-state charter for Nauvoo in 1840. On December 16 the governor signed it into law, granting Smith and the city of Nauvoo broad powers. Among these was the authority to create a "body of independent militarymen". This military force was a militia similar to the Illinois State Militia, and it became known as the "Nauvoo Legion". At its peak, the militia had, by conservative estimates, at least 2,500 troops, in comparison to the approximately 8,500 troops within the entire United States Army as of 1845. The Legion was organized into two regiments (called cohorts) of infantry and one regiment of cavalry. A few light cannons were also attached. The Legion tended to be very top-heavy, in that there was a disproportionate number of high-ranking officers to regular soldiers. Supposedly, this was to elevate the social status and official standing of some members of the city. Depiction of the Battle of Nauvoo by C.C.A. Christensen, which occurred from June 10, 1844 to September 16, 1846. The Nauvoo Legion was ordered to stand down by the Mormon Church elders and not take part in the armed defense but withdrawal of the Saints from Nauvoo for the long trip to Utah. 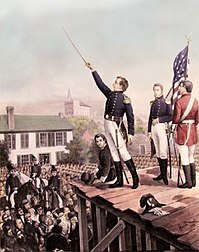 Although the charter authorizing the Nauvoo Legion created an independent militia, it could be used at the disposal of the state governor or the President of the United States as well as for the mayor of Nauvoo. Joseph Smith himself was Nauvoo's second mayor, and the Nauvoo court martial also appointed him as highest-ranking officer of the Legion, a Lieutenant General. This rank is one step above Major General, which most contemporary militias employed as their commanding rank. One motive for the higher rank was to prevent Smith from being tried in a court martial by officers of lesser rank. In 1838 the Missouri militia had contemplated a court martial against Smith, an action that might have been illegal had it been carried out, as Smith was only a civilian at that time. In the last month of his life, June 1844, Joseph Smith declared martial law in Nauvoo in response to various civil disturbances and initially deployed the Nauvoo Legion to defend the city, only to restrain the Legion from any action later. He urged Legion members to not take any action when the Illinois governor ordered the arrests of the Smith brothers, for violating state statutes and by not receiving authorized permission to impose martial law from the Governor of Illinois. Joseph Smith and his brother Hyrum surrendered at the Carthage, Illinois jail, with the promise of protection from Governor Ford and the Carthage Greys, the local state militia in Hancock County. However, on June 27, 1844, the Carthage Greys violated orders and joined the anti-Mormon mob that stormed the jail and murdered the Smiths. The Nauvoo Legion survived the loss of its commanding officer, Joseph Smith, and Brigham Young became the new church president and commander of the militia in August, 1844, though he had never previously been active in Legion activities. Rather than employ the Legion to protect his people from increased mob violence, Young directed most of his followers to leave the city, and Illinois settlement was abandoned by the Mormons entirely by September 17, 1846. Upon the revocation of the Nauvoo Charter in the winter of 1844–1845, the Nauvoo Legion was no longer recognized as state militia, and its members returned the majority of its government-issued arms. Depleted of its official status, remnants assumed a very minor role in future Church affairs after being reorganized in Iowa by Hosea Stout on September 22, 1846. It was never actively employed in defense of the Mormon people. The Utah Territorial Militia was known as the Nauvoo Legion and accused of perpetrating the 1857 Mountain Meadows Massacre in which 120–140 non-Mormon settlers were murdered. Not long after the arrival of the Mormons in Iowa, in 1846, Mormon legionnaires volunteered to serve in the 500 man Mormon Battalion for the U.S. government military expedition to Mexican California during the Mexican–American War. In 1847, Mormon leader Brigham Young reformed the Nauvoo Legion into a fully functional paramilitary force, which was organized into sub-units for each of the Utah counties as the Deseret Territorial Militia akin to their contemporaries the Army of the Republic of Texas and the Texas Rangers. In the 1849 conflicts with Native Americans in Utah County, such as the attack at Battle Creek, Utah and Battle at Fort Utah, foreshadowed the 1853–1854 Walker War between the Nauvoo Legion and Indians led by Chief Walkara ("Walker"). Twenty Mormon militiamen and many Native Americans died in the Walker War. The Nauvoo Legion was called up again in the Utah War against Federal troops entering Utah in the "Utah Expedition" from 1857–1858. They employed tactics of supply destruction and avoided direct fighting. Local commanders and members of the Iron County, Utah Territorial Militia, overcome with suspicion and war hysteria, perpetrated the Mountain Meadows Massacre against a group of wagon trains travelling from Arkansas to California in September. At this point Daniel H. Wells was the chief military commander of the militia. It was also under the auspices of the militia that the groups of men were organized who were instructed to burn down Salt Lake City and other parts of northern Utah should the invading army try to take up residence. After this conflict, the Federal government appointed Utah's territorial governor, and the Nauvoo Legion was allowed to exist at the command of the governor. It however was not as cooperative in imposing the colonial regime as federal authorities would have liked. During the American Civil War, federal troops either were withdrawn from Utah, or in many cases left to join the rebellion, Johnston who had led the invading federal army being among the latter group. The Federal government made a reconciliatory approach to Brigham Young, requesting his help. With his permission, two units of the reorganized Nauvoo Legion were gainfully employed by the United States to protect western mail and telegraph lines from Indian attacks in what is today Utah and Wyoming, but saw no action. Neither the Legion nor any other Mormon troops participated in the main theaters of the war, and the Legion's involvement ended in 1862, after Congress had passed the Morrill Anti-Bigamy Act. The final use of the Legion was in Utah's Black Hawk War 1865–1868 when over 2,500 troops were dispatched against Indians led by Antonga Black Hawk. (Antonga Black Hawk was a Ute and has no connection to the Illinois Sauk chief Black Hawk of the 1830s.) In 1870 the Utah Territorial governor, J. Wilson Shaffer forced the Legion inactive unless he ordered otherwise. Federal troops dispatched in response to the 1870 Ghost Dance ensured Shaffer's order was enforced. The Nauvoo Legion never gathered again, and the 1887 Edmunds-Tucker Act permanently disbanded it. In 1894, in anticipation of statehood, the non-sectarian Utah National Guard was organized as Utah's official state militia. The Nauvoo Legion in Illinois was able to draw on Federal stands of arms. The most common musket issued to these militiamen was the Model 1816 Musket. This flintlock musket was an American built copy of the French 1777 Charleville musket. Also, the Harper's Ferry Model 1803 Rifle was issued in smaller quantities. Personal arms were also used. A small artillery piece, an 1841 12-pound mountain howitzer was issued to the territorial militia. It arrived in Salt Lake in 1852. A carronade, a ship cannon, was purchased by the legion in Nauvoo. It was carried to Salt Lake by the early party that occasionally used it as a speakers podium. It was nicknamed the "Old Sow" and is on display at the Church History Museum in Salt Lake City. When the Mormon Battalion was enlisted in July, 1846, about 450 Model 1816 muskets were issued to the infantry. Five 1803 Harpers Ferry rifles were issued to the hunters of company A. Records for the weapons issued to the other companies are missing. After the men were released from service in 1847, they headed for home, many stopping for temporary employment at Sutter's Fort. 6 of their group built the mill at Coloma, where gold was discovered. Many of them took time to pan for gold and they were quite successful. When they resumed their journey home, they bought two cannons from Sutter, a four pounder and a six pounder. These were thought at that time to have come from Sutter's purchase of the Russian Fort Ross and to have been either Russian or French cannons. This caused them to be lost after the deaths of the battalion members, because the source of the cannons was not written. Sutter wrote a letter to the pioneer society in the 1870s where he said that his cannons, except for one Russian 4 pounder, which he donated to a museum in San Francisco, were all Spanish guns. In 2001 three Spanish guns were identified in the LDS Church storage facility in Salt Lake City. The bronze 4 pounder was found to have the crest of King Carlos 3 of Spain. A 6-pound iron cannon, probably the other battalion cannon and a smaller, but similar, 2 pound cannon were in the warehouse. The provenence of the 2 pounder is currently unknown. All three Spanish cannons, which were brought to Salt Lake City on pallets, were mounted on carriages copied from the mountain howitzer carriage, probably in preparation for the Mormon defense against Johnston's army in 1857. Today the mountain howitzer is on display in the Fort Douglas museum in Salt Lake City. The 4 pound Spanish bronze is in the Mormon Battalion Visitor Center in San Diego, Calif. The is a copy of it in front of the center. The iron Spanish 2 and 6 pound cannons remain in storage in Salt Lake City. ^ Allaman (1990, p. 11). ^ Turner, John G. (1 May 2012), "The Mormons Sit Out the Civil War", The New York Times (online), Disunion: following the Civil War as it unfolded . Allaman, John Lee (1990), "Uniforms and Equipment of the Black Hawk War and the Mormon War", Western Illinois Regional Studies, XIII (1), p. 5 . Allen, James B.; Leonard, Glen M. (1976), The Story of the Latter-day Saints, Salt Lake City, Utah: Deseret Book, ISBN 0-87747-594-6, OCLC 2493259 . Flammer, Philip M. (1992), "Nauvoo Legion", in Ludlow, Daniel H (ed. ), Encyclopedia of Mormonism, New York: Macmillan Publishing, pp. 997–999, ISBN 0-02-879602-0, OCLC 24502140 . Flanders, Robert Bruce (1975) , Nauvoo: Kingdom on the Mississippi (3rd ed. ), University of Illinois Press, ISBN 978-0-252-00561-9, OCLC 12060364 .